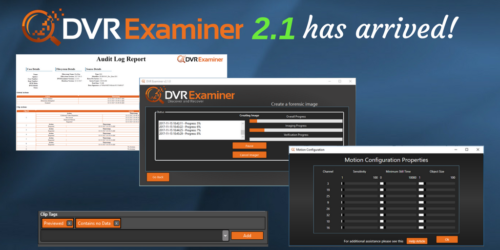 Home DVR Examiner Updates DVR Examiner 2.1 Has Arrived! The introduction of DVR Examiner 2.0 brought big changes to our user interface and workflow flexibility. While some of these changes brought their own challenges, we have been hard at work fixing bugs and updating the program. The return of forensic imaging capabilities, including improved progress and details. Improved support for E01 forensic images, particularly when accessing them over the network. Introduction of “tags” – short notes tied to specific video clips. User-customized motion sensitivity settings. While Motion Analysis is still a beta feature, this is another step in the right direction. New audit log report of user actions. We also fixed numerous bugs to increase stability and keep the program from crashing. However, in the event DVR Examiner does crash, you don’t have to remove and reinsert the dongle anymore! DVR Examiner 2.1 supports three new filesystems (DMD_264_M, STL_264R, and RE4_264) and adds support for one (often requested) filesystem for inaccessible recovery (HIK_264). As we have already announced, we are looking forward to bringing you even more big improvements in January 2018. DVR Examiner 2.2 will include updates to your licensing so that we are able to provide continuous filesystem updates every few weeks.